... iv) the average auto loan hit a duration of 69 months, while the average used vehicle loan has a term of just over 64 months, both rising to new record highs for yet another quarter. ... v) the average price paid for a new vehicle also hitting an all-time high of $35,176, according to Edmunds.com, almost entirely as a result of a massive expansion in consumer credit and record amounts of auto loans. Today, this was confirmed when as Bloomberg reported this morning that "Subrprime new-car buyers suddenly go missing from US showrooms." 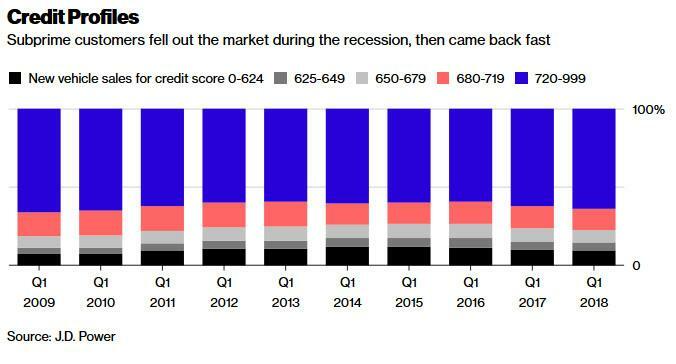 Just as we expected, between record prices (courtesy of what until recently was easy, cheap debt), record loan terms, and rising rates, shoppers with shaky credit and tight budgets have suddenly been squeezed out of the market. In fact in the first two months of this year, sales were flat among the highest-rated borrowers, while deliveries to those with subprime scores slumped 9 percent, according to J.D. Power. 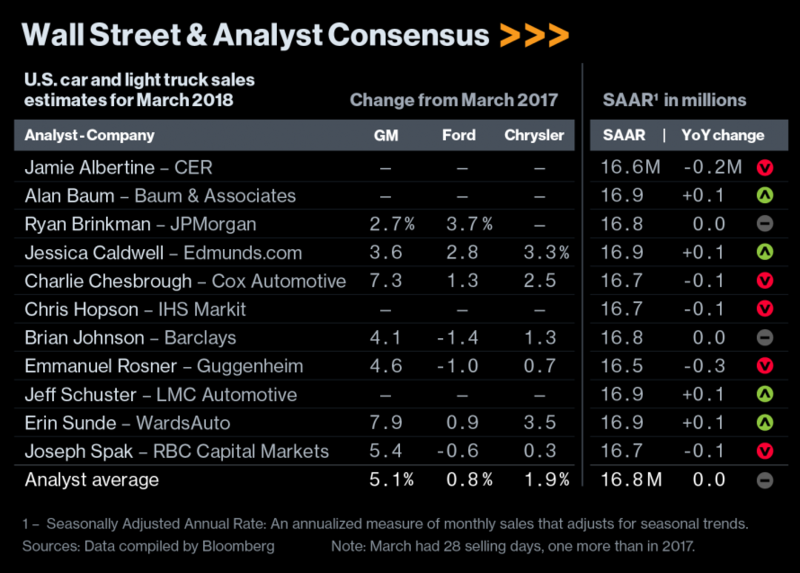 And so, the quiet withdrawal of what was arguably the most important marginal US auto buyer - whose entire purchasing power came thanks to cheap, easy debt - means that carmakers are about to report sales for March which slowed to the most sluggish pace since Hurricane Harvey ravaged dealerships across the Texas Gulf Coast in August, which boosted an auto replacement buying spree and kicked 6 months of life into the struggling US auto sector, according to Bloomberg’s survey of analyst estimates. Call it whatever you want, but the outcome is clear: even the recent modest increase in interest rates has made it prohibitively expensive for most "stressed" households to purchase cars on credit, meaning that the higher rates go, the fewer subprime-driven demand there will be. Westlake Financial Services has specialized in subprime lending since its founding in Los Angeles thirty years ago. Subprime loans now make up just 55% of its portfolio, down from 75% five years ago, said David Goff, vice president of marketing. Which also explains why used car prices, until recently, were at all time highs. After all, if it is very easy to get the required subprime credit, why discriminate based on cost: just buy. And now it's payback time, as the long-overdue disappearance of a major source of auto demand -the US subprime buyer - means the long-overdue market clearing "price correction" (one can use a harsher term here as well) is imminent. There is a silver lining: those responsible buyers who waited until prices dropped, will soon have a bonanza of options as the millions of "lightly used cars" and SUVs are now coming off lease, providing a good supply of better-equipped, nearly new models at falling prices.